On April 5, 2018, the first powered flight test of VSS Unity, the suborbital Notes 1 rocket-powered manned spaceplaneNotes 2 of Virgin Galactic, took place. The American spaceflight company published the highlights video of the event on their YouTube channel. 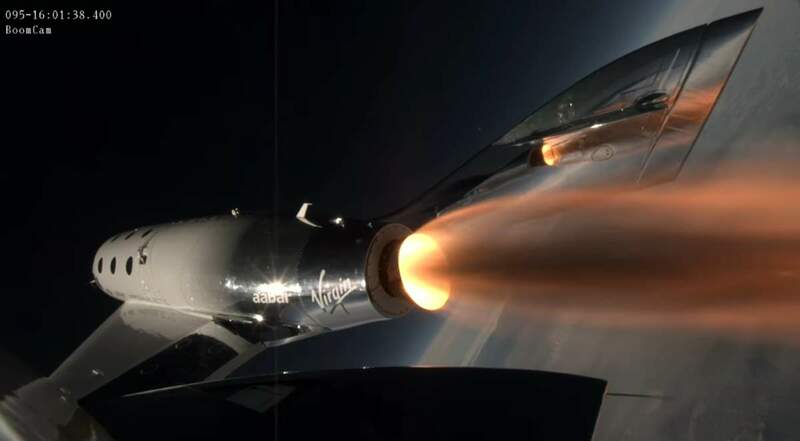 During the flight, VSS Unity fired its rocket engine for 30 seconds, reaching a maximum altitude of 84,271 feet (25,686 meters)Notes 1 and a top speed of Mach 1.87 (1423.46 mph or 2290.832 km/h). VSS Unity during its first powered flight. April 5, 2018. VSS Unity, previously referred to as VSS Voyager, is a SpaceShipTwo-class suborbital rocket-powered manned (six-passenger, two-pilot) spaceplane. It is the second SpaceShipTwo to be built and will be used as part of the Virgin Galactic Notes 3 fleet. The name Unity was chosen by British physicist Stephen Hawking. Hawking’s eye is also used as the model for the eye logo on the side of Unity. It is the second SpaceShipTwo to be completed; the first, VSS Enterprise, was destroyed in a crash in late October 2014. The co-pilot, Michael Alsbury, was killed and the pilot, Peter Siebold, was seriously injured. A preliminary investigation and cockpit video subsequently indicated that the feathering system, the ship’s air-braking descent device, deployed too early. The incident resulted in the first fatality on a spacecraft in flight since the Space Shuttle Columbia disaster in 2003. The survival of pilot Peter Siebold also marks the first time in history that anyone has survived the destruction of a spacecraft during a flight when others on board have died. After the accident, SpaceShipTwo test flights were temporarily suspended. VSS Unity’s First Powered Flight was also the first test since VSS Enterprise crash. Note that VSS Unity is a suborbital spaceplane, but at that first powered flight, it didn’t reach the space (its maximum altitude was 84,271 feet or 25,686 meters). The test flight did not aim to reach space, though. A sub-orbital spaceflight is a spaceflight in which the spacecraft reaches space, but its trajectory intersects the atmosphere or surface of the gravitating body from which it was launched, so that it will not complete one orbital revolution. For example, the path of an object launched from Earth that reaches 100 km (62 mi) above sea level, and then falls back to Earth, is considered a sub-orbital spaceflight. This altitude, known as the Kármán line, which commonly represents the boundary between Earth’s atmosphere and outer space, was chosen by the Fédération Aéronautique Internationale (FAI, the world governing body for air sports). Because it is roughly the point where a vehicle flying fast enough to support itself with aerodynamic lift from the Earth’s atmosphere would be flying faster than orbital speed. A spaceplane is an aerospace vehicle that operates as an aircraft in Earth’s atmosphere, as well as a spacecraft when it is in space. As of April 2018, only five spaceplanes have successfully flown, having reentered Earth’s atmosphere, returned to Earth, and safely landed: the North American X-15, Space Shuttle, Buran (the Soviet counterpart of US’s Space Shuttle), SpaceShipOne, and Boeing X-37. Virgin Galactic is a spaceflight company within the Virgin Group. It is developing commercial spacecraft and aims to provide suborbital spaceflights to space tourists and suborbital launches for space science missions. The founder of the company is Sir Richard Branson.